Holiday development "Porto Sa Ruxi". 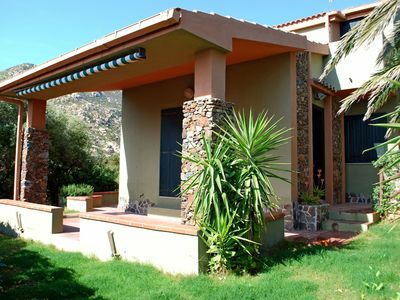 10 km from the centre of Villasimius, in a quiet, sunny position, 400 m from the sea. For shared use: swimming pool (01.06.-01.09.). Parking at the house. Supermarket 2 km, restaurant 2 km, bar 2 km, sandy beach 400 m. Please note: the photograph shows a typical example. There are more similar properties for rent in this same residence. All houses/apartments are individually designed/furnished. 4-room apartment 70 m2. Living/dining room with 1 double sofabed. 1 double bedroom. 1 room with 2 beds. 1 room with 1 x 2 bunk beds. Kitchenette (4 hot plates, freezer). 2 showers/bidet/WC. 1 small pet/ dog allowed.